Charlton assistant boss Phil Parkinson changed his mind about becoming manager of Huddersfield - just over an hour before he was set to be unveiled. Parkinson, 39, who had a spell as Hull boss this season, phoned the Terriers to say he would be staying at Charlton, where he has been since 5 January. His decision to stay is a major boost to Addicks boss Alan Pardew and his bid to keep the club in the Premiership. League One club Huddersfield sacked manager Peter Jackson on 6 March. Academy manager Gerry Murphy will remain in temporary charge of the Terriers. A statement released by Huddersfield vice-chairman Andrew Watson read: "Clearly this is a frustrating development for the club, supporters and other applicants. "We interviewed a number of high quality applicants, all of whom would be able to take the club forward, and it was a very difficult and close decision to choose Phil. "Phil applied, attended two interviews - both of which we understand Charlton were fully aware of - and last Sunday he was offered terms. He shook hands with the board of directors and agreed to accept, subject to a conversation with his wife. 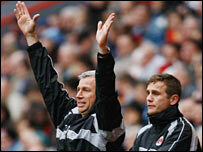 "On Monday Phil called to accept the position and told Charlton, where he is assistant to manager Alan Pardew. We had agreed he would continue in that role until the end of the season or until Charlton's Premiership status was secured. "On Tuesday he called to reiterate and asked the club to tie up when the announcement would be made with Charlton chief executive Peter Varney. "Peter Varney called before lunch yesterday and both parties agreed to announce the appointment at 0930 BST this morning. "Phil then called last night to say that Charlton had made him an unbelievable offer to stay at The Valley and he needed until this morning to decide. "Clearly this is frustrating news for everyone with the interests of Huddersfield Town at heart." 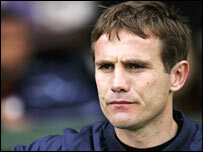 Parkinson led Colchester United into the Championship in 2005/06 but left for Hull in June 2006. His spell at the KC Stadium was an unhappy one and he parted company with the Tigers in December. A statement released on his behalf read: "I have had a change of heart. "I have been enormously impressed with Huddersfield and the integrity of the board. It is a fantastic club, with a great infrastructure, which will go from strength to strength. "However, the lure of working with Alan Pardew and in the Premiership was not something I could walk away from." Charlton plc chairman Richard Murray added: "While Alan Pardew has done a fantastic job and grabbed most of the headlines, the role played by Phil since he joined the club in January shouldn't be under-estimated. "He's played a key role in our recent good form, and I know he is determined to see that job through and ensure we remain in the Premiership."